Calculations at a cross. 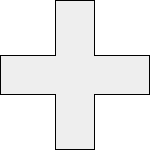 Here a cross are two equal rectangles, which intersect perpendicularly in their centers. So each of the four arms of the cross has the same length and the same width. The result is a rectangular, concave dodecagon with 8 inner and 4 outer right angles. Enter two of the three values a, b and l, choose the number of decimal places and click Calculate. Lengths, width, radius and perimeter have the same unit (e.g. meter), the area has this unit squared (e.g. square meter).